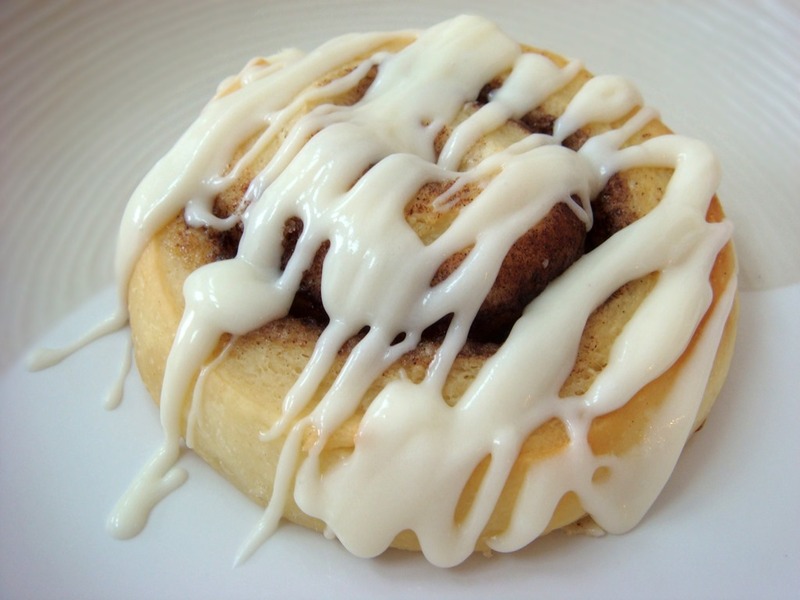 There is something about a soft dough rippled with cinnamon and oozing sweet cream frosting that almost makes you forget about the water dripping into your house from the slowly melting snow on your roof. Almost. 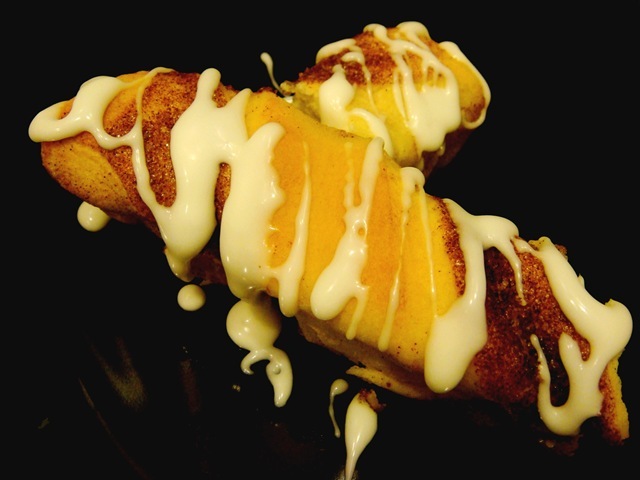 These cinnamon twists are a variation on cinnamon rolls, and just as certain to please. The dough is easy to put together and easy to work with. It goes together quickly, not requiring an initial rise. 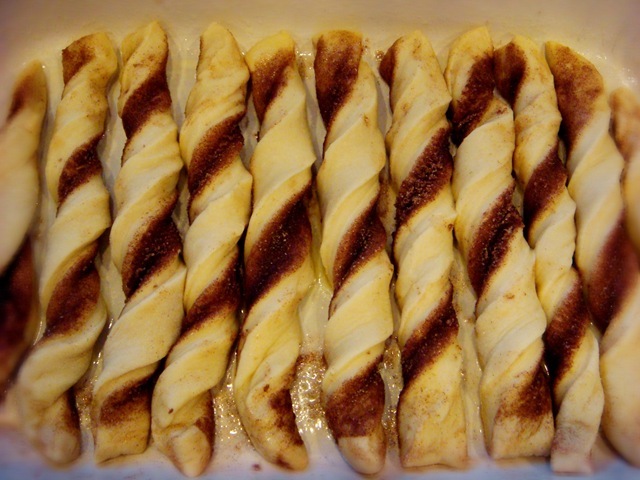 So you can have warm cinnamon twists on your plate in under an hour. Unless you have a bunch of girls staying at your house, and then you will be lucky to snag even one to try and snap a picture of. You might have to settle for the broken one shown above. This is half of the batch of dough. 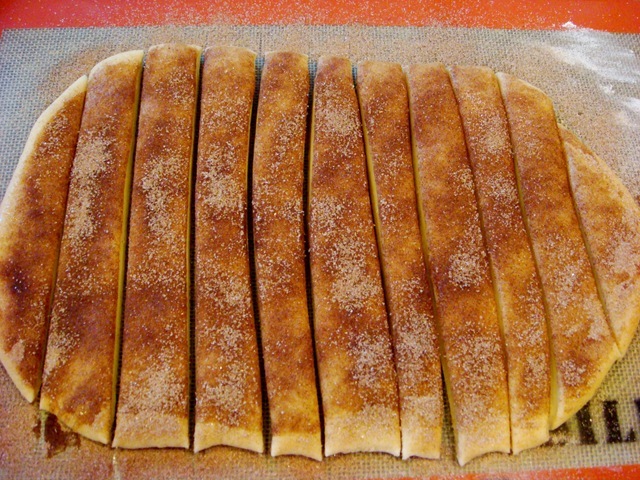 Be sure to use a sharp knife to cut the dough into strips. A round pizza cutter works amazingly! Twist the strips and put into a pan coated with melted butter. This pan is actually a little too crowded. I should have separated them a little more. Let rise in a warm place until doubled in size, and then bake for about 10 minutes and you are ready to eat! I like to use a basic powdered sugar glaze to top these. If I have it on hand, I use cream and powdered sugar. 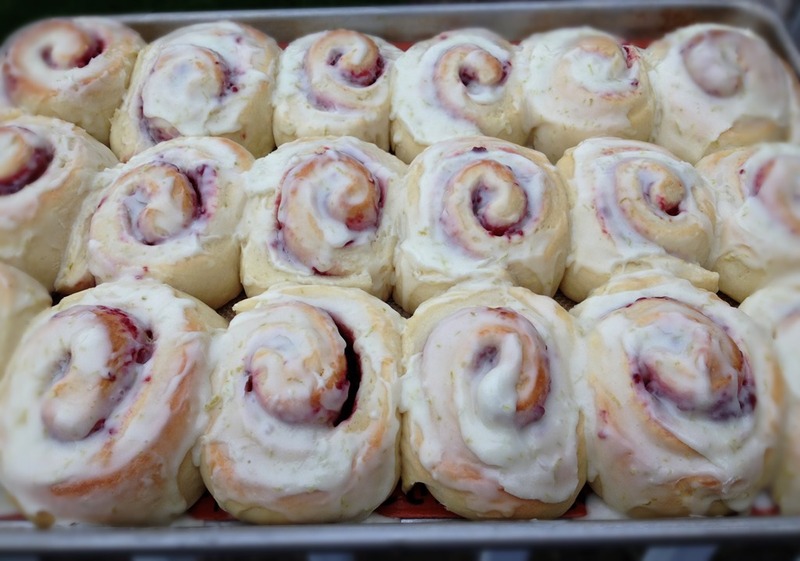 Cream gives the glaze a wonderfully rich taste. You can also use milk, but the cream is definitely worth the extra calories-and if you’re eating cinnamon twists it’s not like you’re counting calories anyway! On a side note: if you make these on the same night you make Fettuccine Alfredo, be sure to label your leftover icing and alfredo containers. While making Big J’s breakfast the next morning (yes, he was having the pasta alfredo and not the cinnamon twists for breakfast), I topped his pasta with a big scoop of icing. Luckily I licked my finger before putting the concoction in the microwave! Mix water, sugar, egg, yeast, salt and flour. Add more flour, if needed, to make a soft dough. Knead until a soft dough forms. 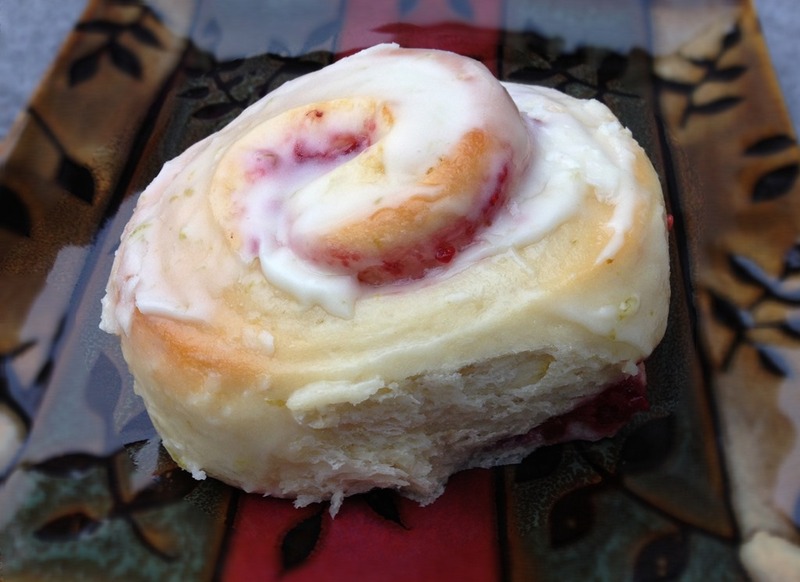 Melt 1/4 cup butter in a jellyroll pan. Roll dough into rectangle. Spread with 1/4 cup softened butter. Mix 1/4 cup sugar and cinnamon. 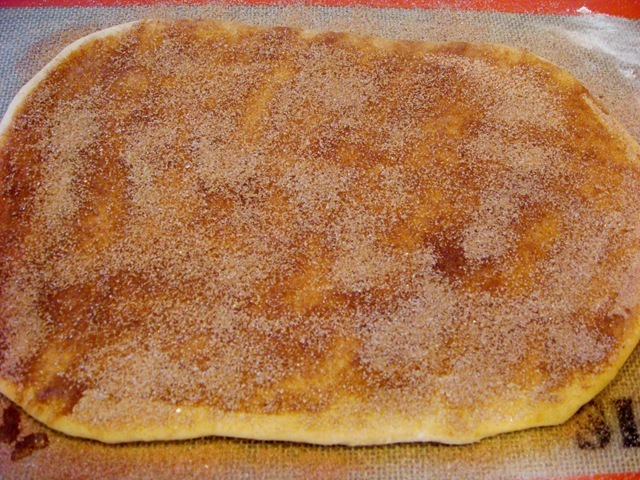 Sprinkle dough with cinnamon and sugar mixture; cut into 1-inch wide strips (a pizza cutter works really well for this); twist each strip gently and place in buttered pan, about ½ inch apart. Let rise 30-60 minutes (until doubled). Bake at 400°F for 10-12 mins. Prepare glaze: Mix powdered sugar with cream, a small amount at a time, until mixture can be drizzled with a spoon. 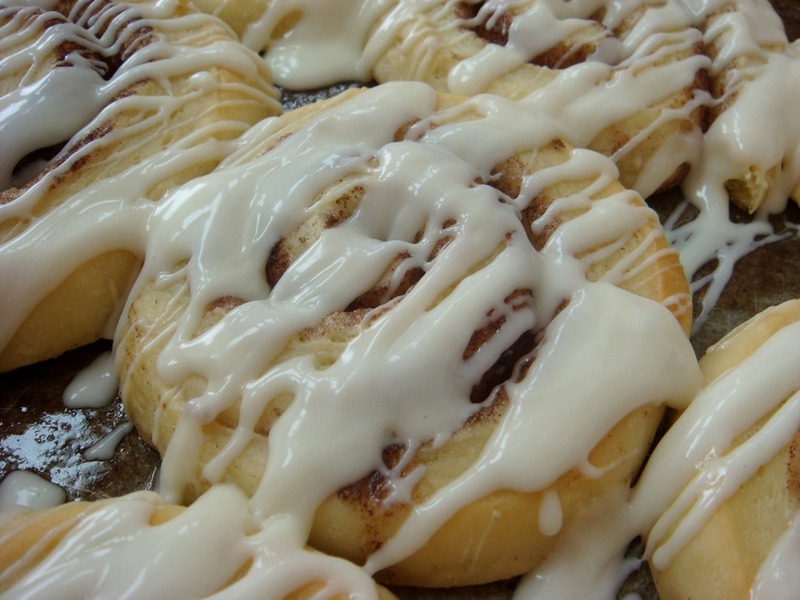 Cool twists slightly, and then drizzle with powdered sugar glaze.